Hello Friends !! I made this soft cake for my group of friends to be served as an evening snack served during our practice sessions. I am happy that everyone enjoyed it !! 1. 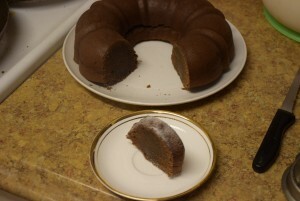 For this recipe we need a 10″ by 3″ inch Bundt cake pan(standard). 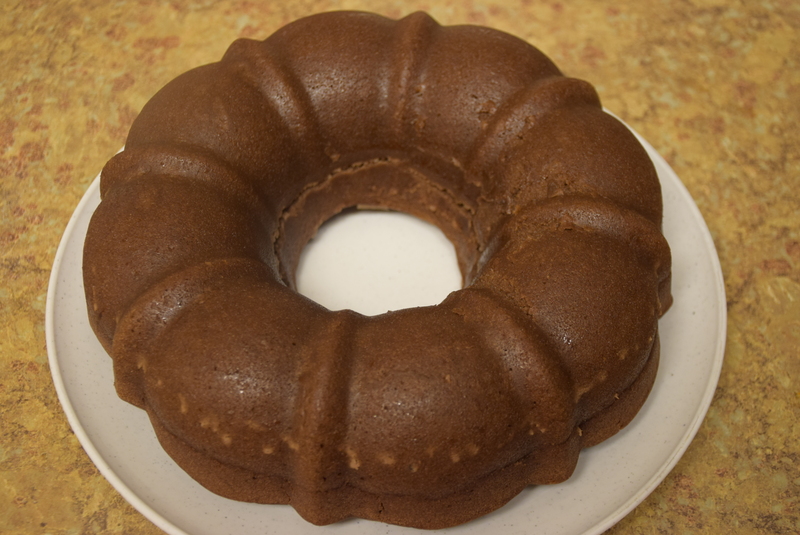 If you don’t have any such bundt pan, then just halve all the ingredients ; because a Bundt pan usually has a larger capacity (12 cups) than the round or square shape pans. Preheat the oven to 350 degree F(180 degree C). 2. Sift in the flour, baking powder, salt ,cocoa powder in a bowl. 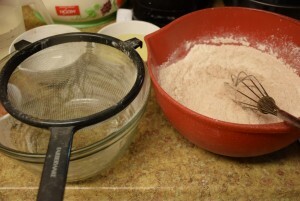 I sifted them 2 times. This sifting helps to incorporate some air in the batter. With a whisk mix them properly. 3. 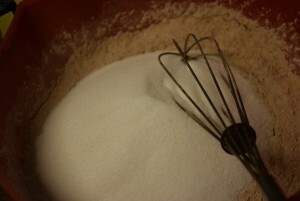 Add sugar and again mix the dry ingredients. 4. 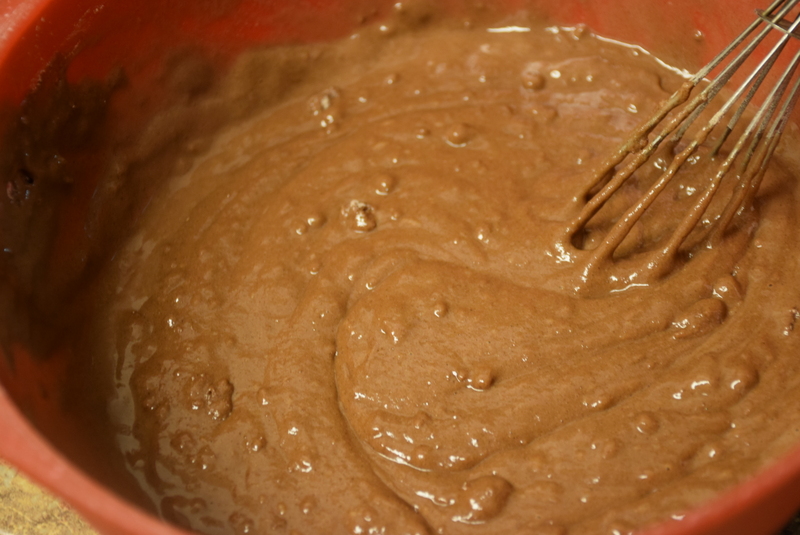 Now add the water and oil slowly to the batter with continuous whisking or mixing the batter.Mix them gently such that no lumps remain and no unevenness is left. Don’t over-mix them. 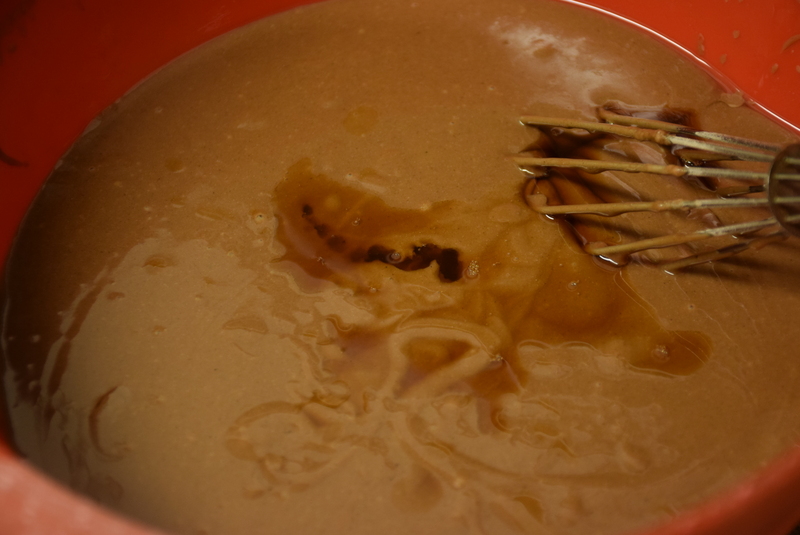 Stir only until everything is dissolved and forms a thick pouring consistency batter. 5. 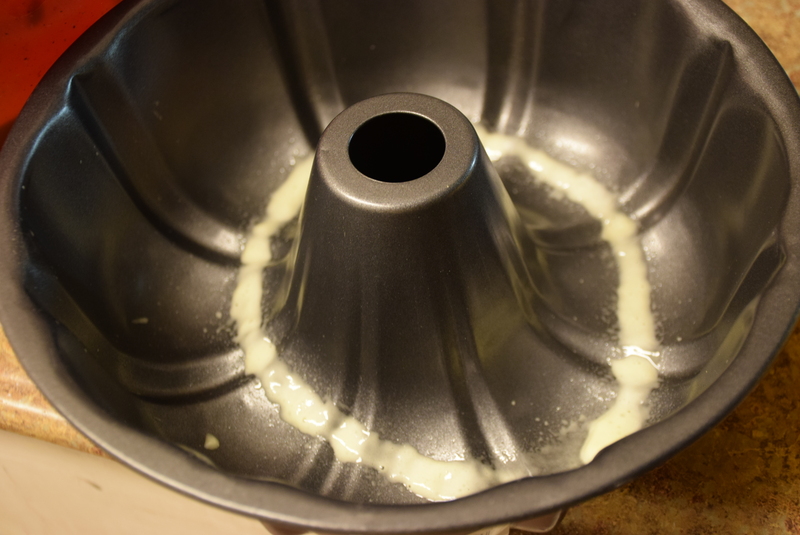 Grease the bundt pan with cooking spray or oil. 6. 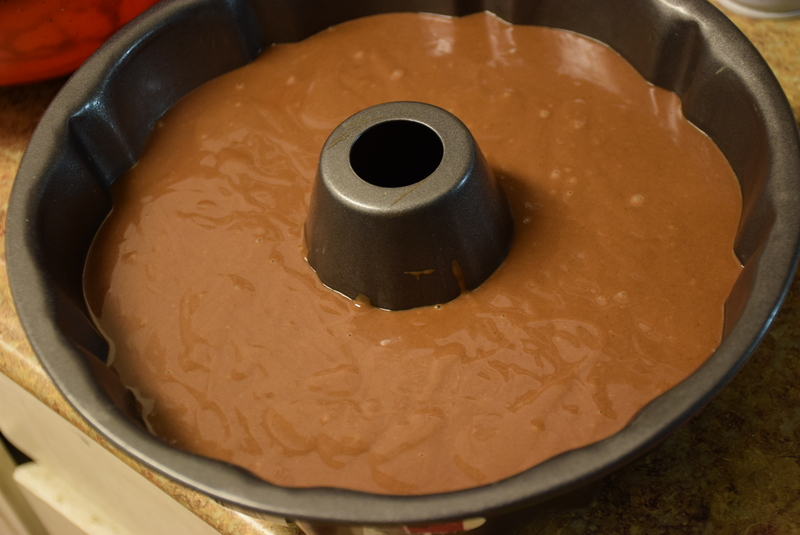 Pour all the batter with a spatula in the pan and gently tap the bottom on the counter to help escape any trapped air bubble. 7. Now place the pan in the oven for 45 mins. Set the timer. 8. After 45 mins take it out and check with a toothpick inserted in the center.If it comes out clean its done, if not keep in the oven for another 5 mins and then check. 9. 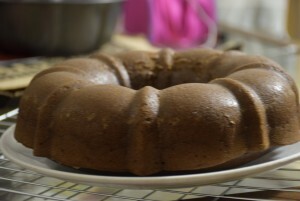 Keep the pan on a cooling rack and allow it to cool. 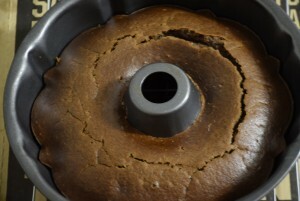 Don’t worry about the top cracks , they will vanish as the cake cools down. 10. 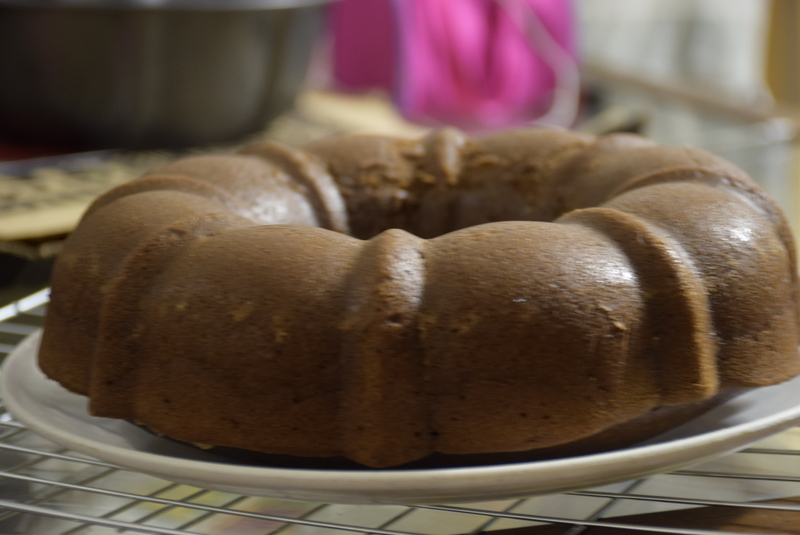 It takes nearly 1.5 hrs to cool the cake completely. 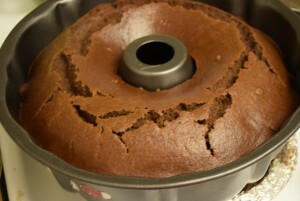 So now ,run a knife all around the edges of the pan inside. Keep a plate on top and invert it over the plate. 11. 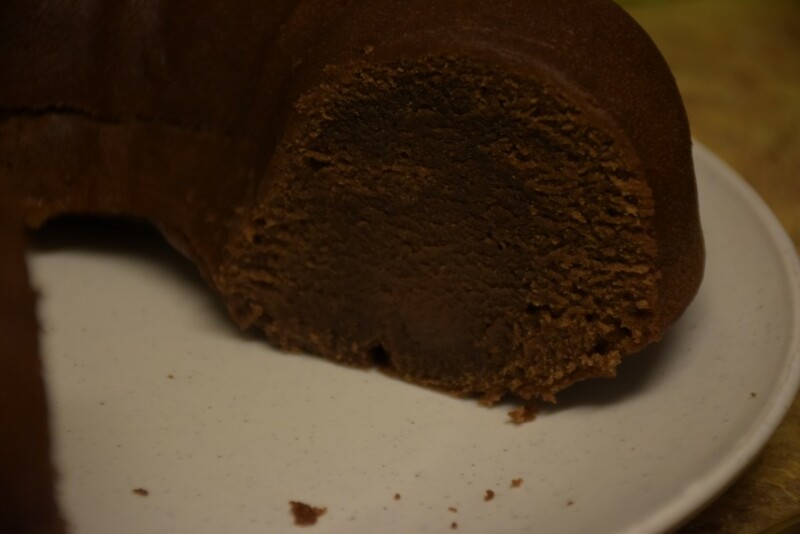 It comes out without breaking moist, spongy, soft egg-less cake is ready to devour. 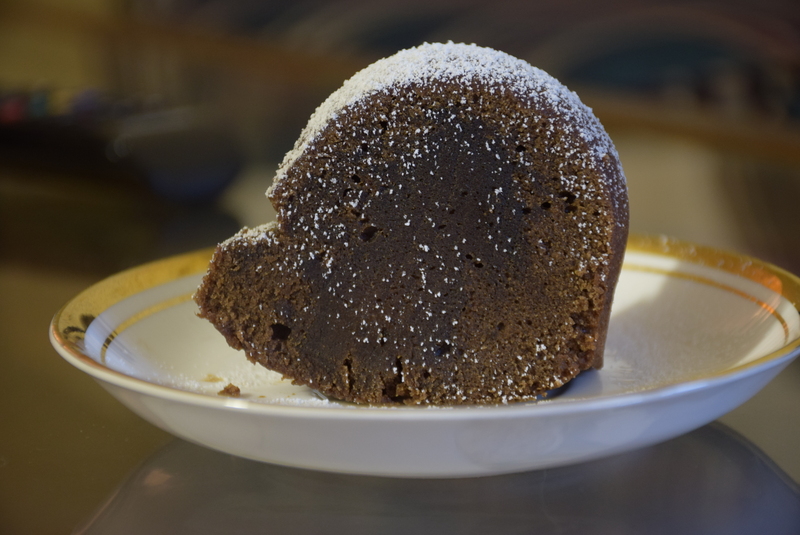 Sprinkle some icing sugar or castor sugar on the top through a sieve or serve as it is!! Or top it with a scoop of your favorite ice-cream and serve as hot and cold dessert. 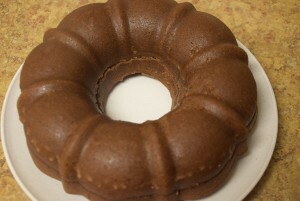 Or top it with some fresh whipped cream or just Nutella !! This entry was posted in Desserts, Food, Recipes and tagged 180 C, 350 F, all purpose- flour, baking powder, Bundt Cake, butter-less, castor sugar, chocolaty, cocoa powder, cold water, confectioner's sugar, egg-less, flavorless oil, granulated sugar, halve the ingredients, maida, mildly sweet, moist, no beater, no condensed milk, no electric beating, no Ener-G egg replacer, no flaxseed powder, no milk, No soda, no vinegar, soft, spongy, vanilla extract, vegan, with ice-cream, with tea, with whipping cream.